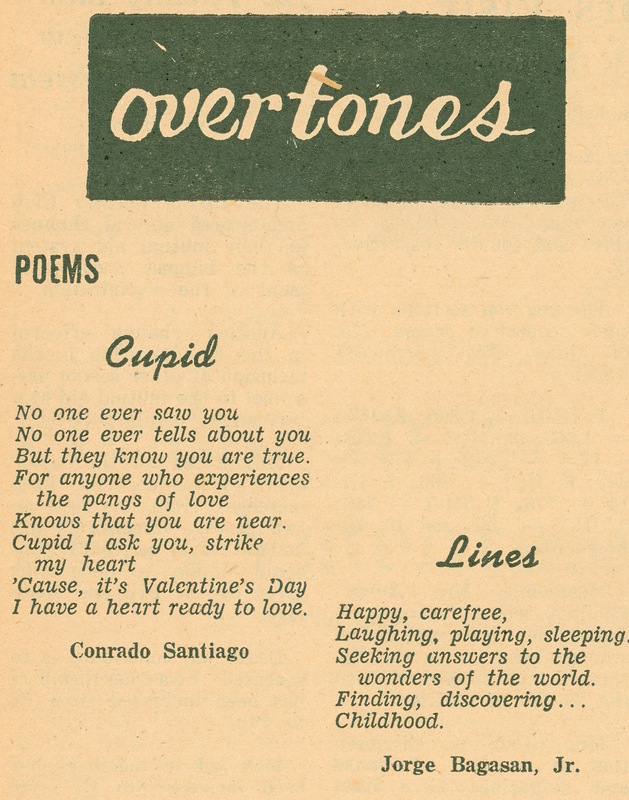 In our previous post we promised we would be featuring poems published in the Valentine’s issue of The Barangay circa 1977. 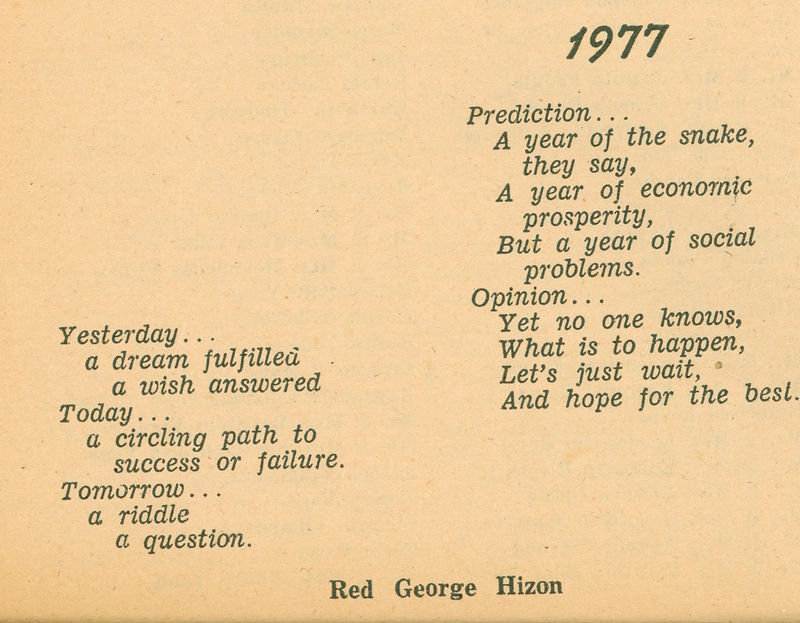 Featured poets are Conrad Santiago, Jorge Bagasan Jr., Zenaida Cervantes and George Hizon. Conrad and Jorge are from IV-3. 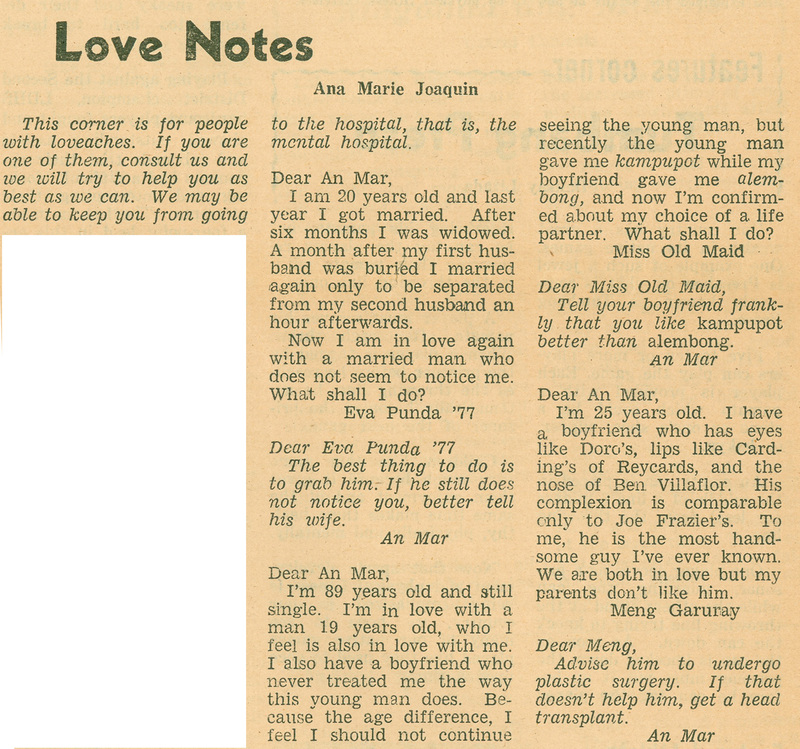 An ala-Tia Dely article written by Ana Marie Joaquin “for people with loveaches” is also published below. 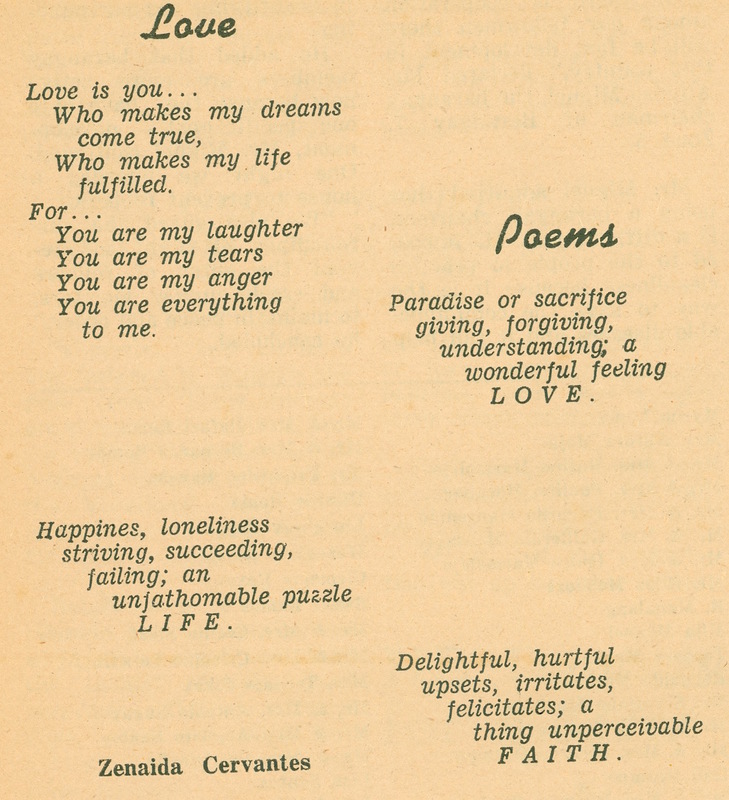 Let’s enjoy these for now as we continue to rummage through our files for more literary gems. We are organizing a visit to the wake of Rosemary ‘Baby’ Hizon, George’s youngest sister, who passed away today. This is the message we got from George: “Baby’s journey is an inspiration. She had touched many people with her love for life, enthusiasm and kindness. I am deeply grateful she is my sister.” Our sincerest condolences to the Hizon family. One of the best things about Christmas is having to celebrate it with your siblings and get the chance to relive your younger years. Keith dela Cruz (above) with sisters Ria and Chiqui and brothers Elo and Gary (minus Lester, who’s in the US) and George Hizon (below) with sisters Rhodora and Rosemarie and brother Rey. This congratulatory message for classmate George Hizon (above, with colleagues) is long overdue. Did you know that he has recently obtained his MBA degree from the Ateneo de Manila University? It took George quite a while to finish his master’s (due to his busy schedule, needless to say), but his belief in the importance of lifelong learning gave him the extra push to go back to school and finally get his diploma. Congrats, George! And, by the way, did you know also that Lito Parungo has gone back to UP for a master’s degree in development communication via distance education? And that Keith dela Cruz is also contemplating doing the same soon? Let’s wish them all the luck. Who was it who said that a birthday is just the first day of another 365-day journey around the sun? Enjoy the trip, George. We have just uploaded photos of our lunch at Cabalen last May 22. Thanks to George Hizon for these nice pictures.